Mohammad Khan Kharoti was born in 1943 in Zabul Province, Afghanistan and up to the age of seven lived in a nomadic caravan. In 1950 his parents settled on land in the Nad-i-Ali District of Helmand Province. His father died when Mohammad was eleven. A year later he did something no one else in his village had ever done; he started primary school. After the completion of primary school, Mohammad was admitted to an auxiliary nursing program in Lashkar Gah Hospital where he was taught by CARE Medico and Peace Corps volunteers. Graduating second in his class, he was offered a job in the same hospital, working with American nurses and physicians, and eventually was promoted to Head Nurse of the operating room and Charge Nurse of the entire hospital. In 1968 Dr. Thomas Roberts, an American AID physician, sponsored Mohammad to study in Lebanon. Wasting no time, he completed the usual six years of secondary school in two academic years and one summer. An American student he had met in Lebanon, Dean McGinty, then invited him to Clinton, Iowa where he lived with the McGinty family while studying at Clinton Community College. He transferred to Coe College to complete a premed program. An outspoken member of the foreign student community, he was elected President of the International Students Club, an office he held until graduation in 1975. That same year he returned to Jalalabad, Afghanistan to enter medical school, a seven-year program including internship. He stayed on there to teach for a year before moving closer to home in Lashkar Gah where he practiced general surgery until 1987. That year he was forced to flee to Pakistan with his family. For the next year he worked for Mercy Corps as a physician teaching paramedics and treating wounded Mujahideen. In December of 1988 he moved to Karachi to work in the American consulate office helping Afghan refugees. In April of 1989 the McGinty family came to Mohammad’s assistance again, this time sponsoring his family in their move to Portland, Oregon. Mohammad began work as an orthopedic cast tech with Kaiser Permanente. He then completed a Nuclear Medicine Technician course and worked for Kaiser and Southwest Washington Medical Center until his retirement in 2011. As a way of thanking all the people who assisted him along the way, Mohammad is eager to help the current youth of Afghanistan. He remembers poignantly the day his own long journey began when he stood excitedly in line having his name added to the list of primary school students. He wants the children of Afghanistan to have the same opportunity to read and write so that they too can interact with the larger world around them. 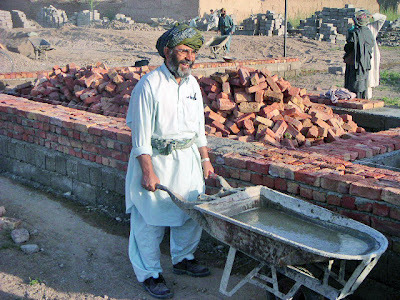 Mohammad will devote the rest of his life to this project.